The mythical Magical Unicorn Society has published its official handbook! 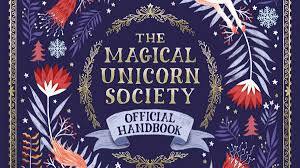 After centuries of mystery, the mythical Magical Unicorn Society has published its official handbook! These learned lovers of unicorns have created a treasure chest of unicorn lore – the facts, the fiction, the where, why and what of these elusive beasts! This is the ultimate gift for anyone who truly believes! Discover the myth of the Gold and Silver Unicorns, and the legendary stories of the seven unicorn families. Find out about their unique powers, where they live around the world, what unicorns eat and how to have the best chance of spotting one. Learn about the history of the Magical Unicorn Society – from its foundation to the present day – and how to become a member. Published by Michael O’Mara Books.